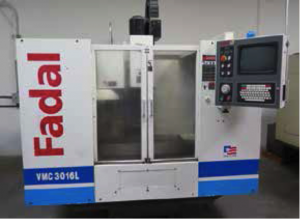 2003 Fadal VMC3016L CNC Vertical Machining Center s/n 032003014987 w/ Fadal Multiprocessor CNC Controls, 21-Station ATC, CAT-40 Taper Spindle, 7500 RPM, 422K Memory Expansion, Rigid Tapping, High Speed CPU, Graphics, 16” x 38” Table, Coolant. 2001 Chevalier 3060VMC 4-Axis CNC Vertical Machining Center s/n MC885CD2 w/ Fanuc Series 18-M Controls, 24-Station ATC, CAT-50 Taper Spindle, 30Hp Motor, 40-4000 RPM, Extended Memory, Rigid Tapping, Chrome Box Ways, Hand Wheel, Flush Coolant, Travels X=60”, Y=31.5”, Z=30”, Full and Partial Chip Enclosures, Coolant. 1997 Cincinnati Milacron “Sabre 1000” mdl. ERO 4-Axis CNC Vertical Machining Center s/n 7039-AOA-97-0883 w/ Cincinnati Acramatic 2100 Controls, 21-Station ATC, CAT-40 Taper Spindle, 10,000 RPM, Thru Spindle Coolant, Travels X=40”, Y=20”, Z=22”, Hand Controller, 20” x 44” Table, Coolant, Cincinnati Milacron NC-12-B 4th Axis 12” Rotary Head with Mill Center. 1990 Fadal VMC4020HT mdl. 906-1 CNC Vertical Machining Center s/n 9009527 w/ Fadal CNC88 Controls, 21-Station ATC, CAT-40 Taper Spindle, 7500 RPM, 20” x 48” Table, Coolant. Mori Seiki MV-80W CNC Vertical Machining Center s/n 21 w/ Fanuc System 6M Controls, 32-Station ATC, BT-50 Taper Spindle, 5000 RPM, 20Hp Motor, Travels X=60”, Y=31.5”, Z=29.5”, 31” x 75” Table, Coolant. CNC Systems mdl. SD850-3 3-Axis CNC Vertical Mill s/n 802392.068 w/ CNC Systems Tiger CNC Controls, 60-4350 Dial Change RPM, 40-Taper Spindle, 12” x 54 ½” Table, Coolant. Hitachi Seiki Hitec-Turn HT-20 CNC Turning Center s/n 21718 w/ Fanuc System 10TE-F Controls, Tool Presetter, 10-Station Turret, Hydraulic Tailstock, 3500 RPM, 8” 3-Jaw Power Chuck, Coolant. H.E.S. “HES-20” Type 550 20” x 70” Geared Head Gap Bed Tracing Lathe s/n 13936 w/ 36-1800 RPM, Inch/mm Threading, Tailstock, Steady Rest, 11” 3-Jaw Hydraulic Power Chuck, Trava-Dial, Coolant, Ernault-Somua Tracing Attachment. Graziano Tortona SAG-210 18” x 58” Geared Head Gap NC Tracing Lathe s/n 918883 ( HAS CONTROL PROBLEMS ) w/ SAG210im Controls, 38-2000 RPM, Inch/mm Threading, Tailstock, Steady Rest, Duplomat Hydraulic Tracing Attachment, 14” 4-Jaw Chuck, 10” 3-Jaw Chuck. Bridgeport Series 1 – 2HP Vertical Mill s/n 1911105 w/ Aurki 3-Axis DRO, 60-4200 Dial Change RPM, Chrome Ways, 9” x 42” Table. Harig “Super 618” 6” x 18” Surface Grinder w/ 6” x 12” Fine-Line Electromagnetic Chuck. Cuttermaster mdl. FCG-30 Tool and Cutter Grinder s/n 1283B w/ 5C Air Fixture, Diamond Grinding Wheel. Rutland 2” Belt / 6” Grinder.